In my local (market) town there has been uproar that a chained coffee shop is shoehorning their way in. I feel for local trade, as my town is built on passing trade created by the local canal system but what cannot be ignored is the efficiency by which such units are put up, with little fuss to the surrounding area, plus the injection of local jobs. Although I have been involved in building products for over a decade, my interest in offsite largely came from listening to the CEO of Build Offsites talk on how a certain american fast food chain (that doubles up as a purveyor of plastic tat that children gleefully bring home to store behind sofas) can now erect a site in under a week. Work on a £10 million restaurant development on the edge of the city centre is nearing completion. Fencing around the site opposite Octagon Retail Park and Premier Inn, off Etruria Road, Hanley, has now been removed. 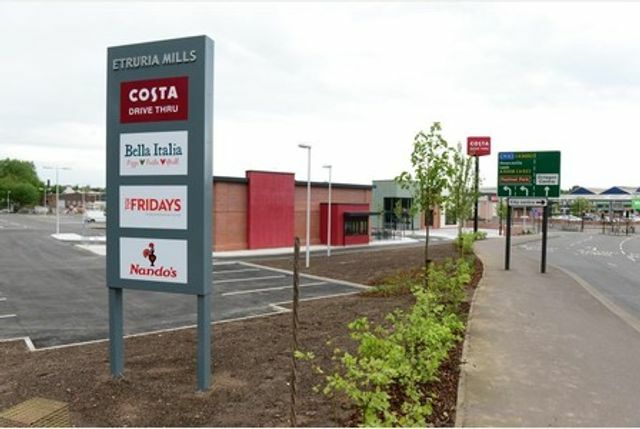 National chain Costa Coffee is set to open a drive-through cafe on the former wasteland, while Bella Italia, TGI Friday's and Nando's will be opening restaurants. The development is expected to create 140 jobs with Costa Coffee taking on a further 18 full and part-time staff. It comes as budget chain Premier Inn is set to extend its £7 million hotel with an extra 44 rooms, while Hilton has revealed it will be opening on a 140-room four-star hotel on the Smithfield development.